Tributes have been paid to a "funny and intelligent" schoolgirl who was fatally stabbed in an east London park. Jodie Chesney, 17, was stabbed in the back as she played music with friends in Harold Hill on Friday night. The Metropolitan Police said officers' shifts had been extended amid a "tragic" 10 days of violence in the capital. Police are searching for two suspects in connection with Jodie's death and have made no arrests yet. The principal of Havering Sixth Form College, where Jodie was studying for her A-levels, said her loss was "devastating to staff and students". Paul Wakeling said: "Jodie was an excellent, hard-working and focused student," he continued. "Our focus for the next few days will be on providing support for the college community as a whole with additional help, as needed, for those who knew Jodie personally." Jodie was a member of the Greater London North East Scouts. 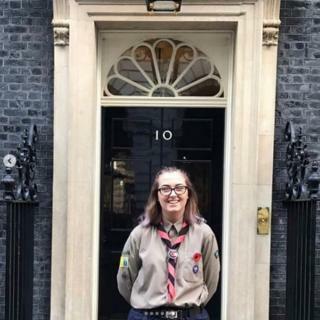 Anna Skipworth, district explorer scout leader, said Jodie "blossomed into an amazing young woman" during her time with the Scouts. "She always had a smile on her face, supporting the younger members where she could," she added. "She was funny, intelligent and a joy to work with." A school friend of Jodie's said she was "disgusted" by the killing. "Jodie had no enemies, she was the nicest person," she added. Graham McNulty, deputy assistant commissioner for the Met, said more officers were out on patrol as "one incident, one injury, one death is one too many". "We have had a tragic 10 days in London where we have seen a number of high profile, violent incidents," he added. He said officers had carried out 2,500 stop-and-searches in the past three days. Home Secretary Sajid Javid condemned the "senseless violence" that has seen a rise in the number of teenagers being stabbed to death across the UK. A day after Jodie's murder, 17-year-old Yousef Ghaleb Makki was stabbed to death in the village of Hale Barns in Greater Manchester.